The belief that God is a Trinity – one God in three persons, Father, Son and Holy Spirit – is fundamental to Christianity, central to the whole understanding of the divine nature and the story of human salvation. Although the term 'Trinity' does not appear in the Bible, it expresses thoroughly biblical teaching. It was developed by the early Christians as the only way to account for the revelation of God in Jesus Christ through the power of the Holy Spirit. 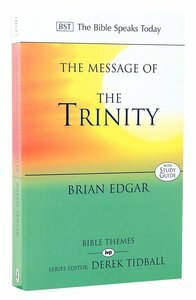 Brian Edgar's conviction is that the Trinity is fundamentally simple, thoroughly practical and theologically central – not abstract, obscure or irrelevant. With warmth and clarity, he expounds a range of biblical texts to show that God can indeed be known, and experienced in Christian life and ministry, in his glorious three-in-oneness. About "BSTT: Message of the Trinity"
Brian Edgar is Director of Theology and Public Policy for the Australian Evangelical Alliance. He was previously lecturer in theology and ethics at the Bible College of Victoria and is an affiliate professor at Asbury Theological Seminary in Kentucky (USA). His publications include The message of the Trinity: Life in God The Bible Speaks Today Themes and co-editor and contributor to Whose Homosexuality? Which Authority?